Maleny police have been generously thanked by the community. 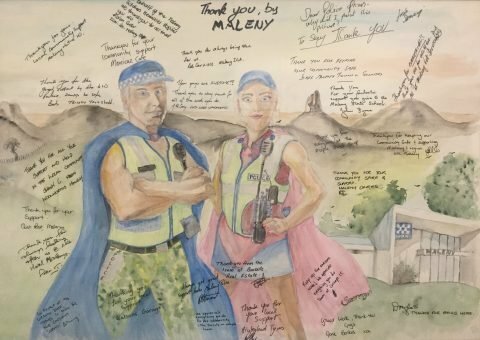 Lazlo Szerenyi, a community resident and talented artist of Maleny wanted to thank the local police for their commitment to the community by painting his first every water colour piece. Lazlo featured the new police station with the hinterland as a back drop and a cartoonistic male and female officer in superhero attire. Several businesses were approached and willingly supported the gesture with messages of thanks in their signatures on the artwork. The piece was framed by Lazlo and presented to the Acting Officer in Charge of the Station, Sergeant Kelly O’Brien. The artwork is proudly displayed in the foyer of the new station for all the community to see.